Topics: Coom, Pami, Symbiosis Institute Of Design [sid], and Symbiosis School Of Economics [sse]. Age: It went live on January 27th 2006, making it over 12 years, 2 months old. 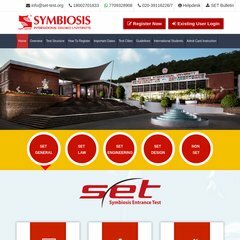 set-test.org Symbiosis Institute of Design [SID] - Symbiosis Bachelors Degree .. The estimated 257 daily visitors, each view 1.50 pages on average. There are 2 Nameservers, dn2.podc.com, and dn1.podc.com. ASP.NET is its coding language environment. It is hosted by Internet Service Provider (North India, Mumbai,) using Microsoft-IIS/6 web server. PING www. (203.199.134.245) 56(84) bytes of data. Website load time is 1434 milliseconds, slower than 50% of other measured websites. As well, a ping to the server is timed at 264 ms.